One tense exchange centered around a report from the Cook County inspector general that found Pritzker participated in a “scheme to defraud” local taxpayers by getting his property tax bill reduced through false affidavits and having the toilets removed from a mansion the Hyatt-heir owns. Pritzker said he followed the rules, and that the controversy exposes flaws in the assessment system. Pritzker has maintained that the inspector general’s report contained inaccuracies, and for the first time on Tuesday his campaign gave its reasoning for that claim, including that the assessor had determined the Astor Street home was “inhabitable irrespective of the toilets,” such as a staircase that wasn’t structurally sound. According to the campaign, a check for $330,000 – the amount that would make up the difference in what Pritzker would have paid had he not won the tax breaks – is now in the mail. Pritzker likewise accused Rauner of criminal activity for his administration’s handling of a Legionnaire’s outbreak in the state veterans’ home in Quincy; Attorney General Lisa Madigan is investigating. 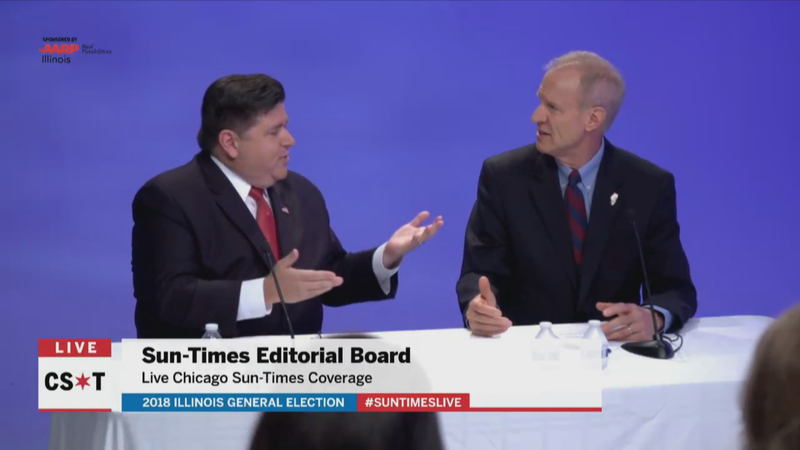 The two also sparred on tax policy (Pritzker wants to make it “fairer” by moving to a graduated income tax that would tax wealthier residents at a higher rate, though he has not provided details; Rauner said without structural changes that is “green light to raise taxes on everybody”), the economy (Pritzker wants to stop Illinois residents from moving out of state by raising the minimum wage and by investing in Illinois universities and community colleges, Rauner said the solution lies in reducing regulations on businesses and in curbing government corruption) and immigration (Rauner, in an apparent attempt to appeal to the conservative wing of the GOP, here made his strongest comments yet). Pritzker took issue with Rauner’s phrasing, saying that the proper term should be “undocumented immigrants” and that those living in Illinois without the appropriate legal paperwork are not a burden on the government. Both candidates were also asked about how they deal with stress, and about their health. Rauner often talks about how being governor has caused him to lose weight and hair. The governor said he deals with stress by riding his Harley, ice-skating or roller-blading and swimming. Pritzker says he decompresses with friends, by playing tennis or taking walks along the lakefront. “I’ve had a weight problem nearly my entire life, like a lot of other people. I’m always struggling with it. There’s no doubt about it. I always monitor it because my father passed away when I was young of a heart problem. I’m always concerned about it,” Pritzker said. As for their reading and TV habits? Pritzker most recently read “Industries of the Future” about artificial intelligence by Alec Ross, and he watches “Atypical” on Netflix. Tuesday marked the final day to mail forms to register to vote in time for Illinois’ general election on Nov. 6, but if you don’t make it to a post office, there are still plenty of other ways to register either in person or online. Opportunities to watch the leading candidates for governor face-off are fewer. Their final scheduled face-to-face is set for Thursday in Quincy, which is on Illinois’ western border with Missouri.